This is so hilarious! Let Scaramucci be Scaramucci! I watched Karl Rove on Fox acting mortified over the report new Communications Director Anthony Scaramucci gave a profanity-laden interview to the New Yorker. I don't see the big deal considering The Mooch has a very tough job of ferreting leakers in the White House. He's a street fighter like Trump and times like this calls for getting nasty to get the job done. It may not be the Washington way. But, there's nothing about Washington that works in the real world. 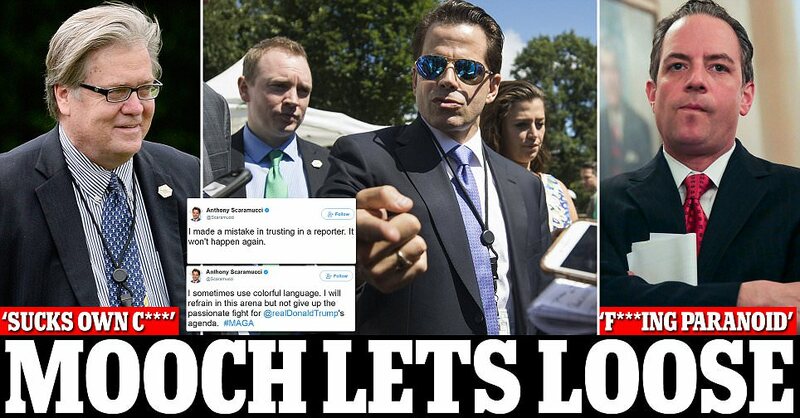 Daily Mail reports new communications director Anthony Scaramucci turned on a journalist for publishing his foul-mouthed rant against senior White House officials Reince Priebus and Steve Bannon on Thursday. 'I made a mistake in trusting a reporter. It won't happen again,' he tweeted. The message was aimed at New Yorker reporter Ryan Lizza who revealed Scaramucci's extraordinary, expletive-filled rant earlier in the day. In a phone call with Lizza late on Wednesday night, a 'worked up' Scaramucci told Lizza that White House Chief of Staff Priebus was a 'f****** paranoid schizophrenic' and 'c**k blocker' who he was sure had leaked information to the press about him. He was as merciless in his characterization of senior strategist Steve Bannon who he accused of 'sucking his own c**k'. At first, Scaramucci seemed unperturbed that his profane remarks had been shared. In an afternoon tweet, he accepted his language was 'colorful', vowed to 'refrain in this arena' and pledged his support to the president and his agenda. The stunning interview came after Scaramucci's financial disclosure form was published online, which he thought was a leak, and after Lizza revealed details of his dinner with the president.